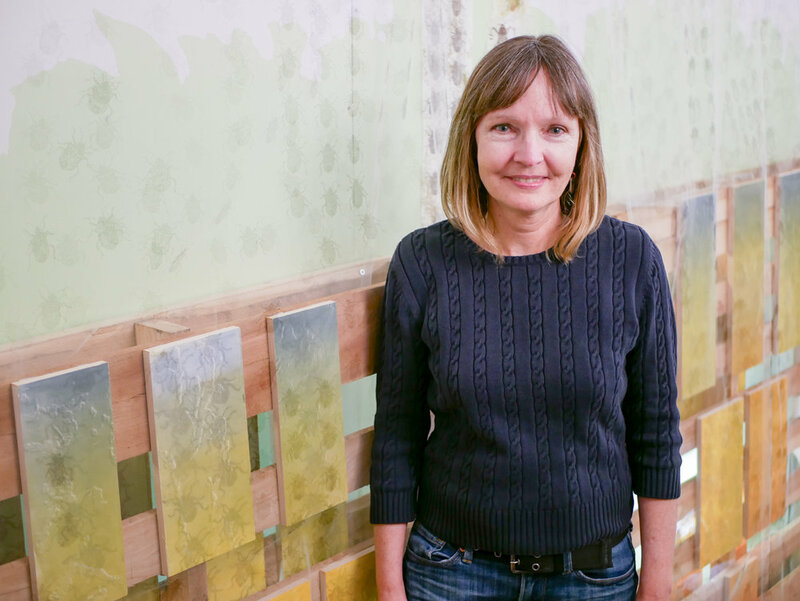 Maggie Gourlay is a visual artist whose work includes both installation and two-dimensional media to visually research our narratives of home. This current exhibit highlights Gourlay’s concern with our larger home, the Earth, in hopes that it might provoke more thought and action to preserve our planet for future generations. Gourlay has exhibited her work widely, and has had artist residencies at the Vermont Studio School and Pyramid Atlantic Arts Center. She has been a semifinalist for the Janet and Water Sondheim Prize and the Trawick Prize, and is a recipient of purchase grants from the DC Commission on the Arts and Humanities. Gourlay received her MFA from Towson University and has taught art at Montgomery College in Rockville since 2010. JD Deardourff is an artist residing in Washington, DC. In 2012 he received a BFA with an emphasis in printmaking from the School of the Art Institute of Chicago, where he studied under Karl Wirsum and Albert Ohlen. JD is interested in the vocabulary of comic book art: exaggeration, energy, movement, contour line, the interplay of sequential images, and, most importantly, artificial color. He collages this imagery into unpredictable, abstract, and bittersweet compositions that are simultaneously optimistic and apocalyptic. JD has exhibited screen prints, collages, and paintings in Paris, San Francisco, Los Angeles, Chicago, Brooklyn, Philadelphia, Baltimore, and DC. He has been a Yaddo Fellow, an artist in residence at Emmanuel College, a Fine AIR at the Strathmore Mansion, the resident artist at Open Studio DC, and is currently an emerging art fellow at the Touchstone Foundation for the Arts. In addition to his personal artwork, JD has worked with commercial clients including Burton Snowboards, Converse, DC Comics, Misfit Juicery, Honeygrow, Cava, Sweetgreen, and the DC Department of Public Works. Noa Heyne is an interdisciplinary artist working in Baltimore, MD. In her work, Heyne uses sculpture, animation and mechanical systems of interaction to explore the manifestation of movement in natural and urban environments, as agency, circumstance or obstacle. Her sculptures and installations emphasize the physical engagement of the visitors with the objects around them, and the memories carried by the body through visceral experiences. Originally from Israel, Heyne moved to Baltimore in 2015 to study in the graduate program at MICA, and received her MFA from the Rinehart School of Sculpture in 2017. Her work has shown in Israel and the U.S, and is in private collections in Tel Aviv, Jerusalem, London, New York and Baltimore. She currently teaches at MICA and is a fellow of the LAB (Launch Art in Baltimore) grant. Heyne is a 2018 Baker Artist Award Finalist. Amanda Burnham is an artist and associate professor based in Baltimore, MD. Burnham received her BFA from Harvard University and MFA from Yale University. Burnham is interested in exploring the darkly comic, absurd, and idiosyncratic personal iconography in the built world. Composed of collaged drawings transposed onto built wooden structures and then carefully lit, Burnham’s work is part theater set and part sculptural drawing. Burnham has received the Creative Baltimore Fund Award and an Individual Artist Award from the Maryland Arts Council. Her work has been featured in exhibitions in Switzerland, New York, Miami, St. Louis, and has featured extensively in the DC metro area. Additionally, she was an artist in residence at the Embassy of Foreign Artists, Geneva, Switzerland in 2015 and Swatch Peace Art Hotel, Shanghai, China in 2015. Amy Wike is a DC based fiber artist and lifelong knitter. Wike received a degree in Marketing and Entrepreneurship Management with an Art History Minor in 2008. She is interested in drawing attention to the complexity of everyday speech through knitted sculptures. The sculpture serve as amorphous shapes that act as visual representations of the intricacies of communication. Jung Min Park is a mixed-media artist living and working in the Washington, DC area. Her work explores how people observe, experience, and interact with both nature and their urban environments. She is especially interested in memory and imagination, and the play between the two. The positive and negative spaces in her mixed-media works represent the boundaries between consciousness and unconsciousness. Recent exhibits include solo shows at Arlington Arts Center, DC Arts Center, and Hillyer Art Space. She was also invited to participate in group shows at Grizzly Grizzly in Philadelphia, The Painting Center in New York City, and POSCO Art Museum in Seoul, South Korea. Park holds a Bachelor of Fine Arts in Painting and Installation from the Korean National University of Arts, a Bachelor of Fine Arts in Painting from The School of the Art Institute of Chicago, and a Master of Fine Arts in Painting and Drawing from the Pratt Institute. She currently holds a Studio Residency at Arlington Arts Center. Nara Park is a sculptor and structural artist who received her bachelors in General Fine Arts and masters in Sculpture and Certificate in College Teaching of Art from the Maryland Institute College of Art in Baltimore, MD. In her work Park uses false material like stone to create sculptures and installations. These pieces are part of Park’s exploration of authenticity and what exists beyond people’s superficial perceptions.